I love tomatoes, and so does my husband - my children do not like them too much, yet. I like to grow lots of varieties. I try several heirloom varieties. This year I tried Black Krim, Brandywine, and several others that I cannot remember the name. I love Brandywine. I am sure you heard that before... I actually thought it was just marketing that people were talking so much about this tomato. But boy, was I wrong: they are so good. I have tried others, but I like Brandywine the best. This is the way that all starts... Seeds. I plant lots of seeds around February, and take a lot of good care of them so they survive. As soon as the seed sprout, I take them outside to my mini-greenhouse. I have a new greenhouse, as my old one was really falling apart. I believe the name was flower house. After 3 years of good use, the fabric fell apart. The older one was very low, and I had to sit down in order to take care of the little plants. This one is vertical, with 4 shelves. It is much easier to put the plants down. However, I have to be careful to provide enough sunlight for all of them. Also, the cover is made of plastic. I am not sure how long it will last. But I am happy with it. In the picture below, I tried to point where some of the tomatoes were. 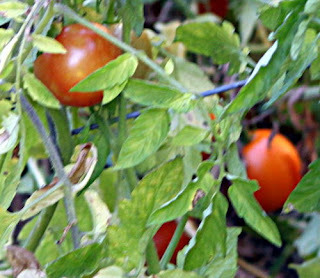 In particular the one pointed at is Black Krim, a Russian heirloom tomato. 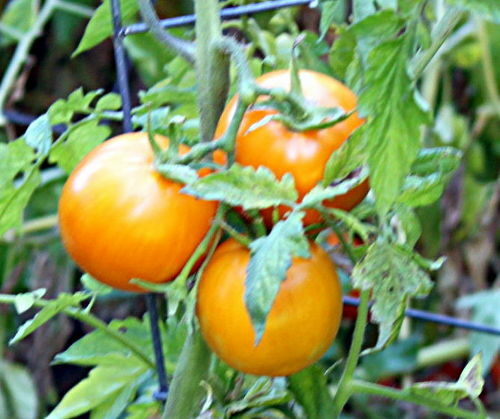 As I mentioned before, my tomatoes only started to mature almost at the end of August, as we did not have a hot summer in Silicon Valley, where I live. But when the heat started.... my tomatoes made me smile. Do you see these red tomatoes? These are some Brandwines. I did not get too many of them. But, I enjoyed the ones I got. Another tomato that I really like is Jubilee. They are yellow, big, and meaty.. I planted some this year that did not turn out very good. I wonder if these are the ones from some seeds I saved last year... They were too soft and squishy and small ... Jubilee are meaty and delicious. They are big. I did get some of the good ones. I am not saving seed this year, as they are hybrid, and I only wanted to check. I will just buy the seeds next year. Still pretty.But most of them were small. I had to try and see if the seeds were going to turn true to the kind. But they did not. No big deal: I always like to make experiments and take chances. Not much too loose. The reality is I try to label the tomatoes, keep the names as I label the seedlings. But I plant so many together, that at the end it is a crazy, delicious mass... Lots of leaves that make it even hard to pick the tomatoes, let alone see their names. Sometimes I do not know the type I am eating, but I do not care... I only want it to be tasty. This year I had a good weed control. When a company came to cut one of my trees, I asked that they dump their truck in my driveway. I spread the wood chips all over my yard (and yes, I did not get any help). It was very labor intensive, but save me a lot of time during the whole summer, and now during the fall, as I have very little weeding to do. I will also try to make bigger labels, so I can read far away. Not a priority, as I can recognize the tomato that I like best: my Brandywines!!! How about you? Which tomatoes did you grow this summer? Which ones did you like best?